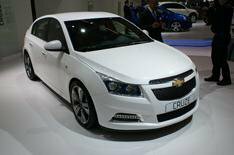 Chevrolet Cruze | What Car? A new five-door Chevrolet Cruze was shown today in Paris, and will join the existing four-door saloon in showrooms from the middle of next year. ?? Despite looking similar, the hatchback differs from the saloon with a coupe-like roofline and shorter rear overhang, for a far sportier profile. ?? The range of engines and trims will mirror that of the saloon, although the new hatchback will be launched with Euro V-compliant engines, which will find their way into the saloon in due course. Chevrolet has labelled this a show car, so theres no way of knowing if all of the design details, such as the LED running lights set into the front bumper, will make it onto the production car. However, it has confirmed that the five-door, five-seat car will have a 400-litre boot (50 litres less than the saloon), with 60/40 split-folding rear seats.